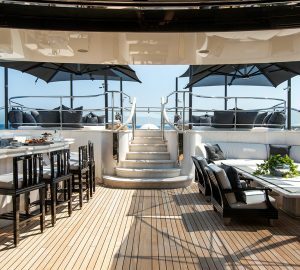 Light and bright interior, excellent outdoor spaces, Jacuzzi and incredible water toys are just some of the notables features of the 50m luxury motor yacht Chasseur. Taste the high life on board Chasseur. There’s something different waiting around every corner and in every port you visit. 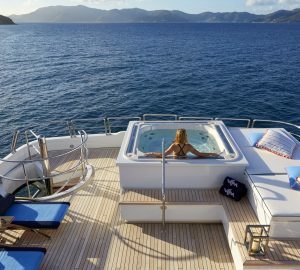 If you’re ready for discovery, an unbeatable on board service and lots of relaxation, Chasseur charter yacht is the best choice you could make. She has a fabulous interior with amazing retro artwork and photographs all over the vessel. Vibrant colours compliment the neutral tones along with luxurious accessories and textiles. Silk and wool rugs adorn Chasseur with milk glazed figured sycamore walls offsetting teak flooring. The lighting on board can be dimmed to create a restful, serene ambience. 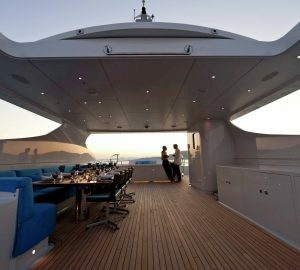 With the scene set, let’s talk about what you can enjoy on board this yacht. As soon as you step onto Chasseur you’ll notice the gorgeous décor and won’t be able to wait to see the many different areas on board. In the formal dining area, there’s a breath-taking Armani custom-designed table. With a backdrop of china sliding door panels in shell with chrome borders, this space can be closed off if you’re holding a private party. The curved stairwell is definitely a work of art and showcases what appear to be floating glass treads. The woven leather walls and wood sculpture by Mathieu Nab Azove welcome guests in the doorway. There are many lounging and seating areas both indoors and outdoors. The sun deck bars and sky lounge have backlit crystal agate and mirrored glass giving a look of space, space and even more space. This is a great spot for socialising or dining al fresco. The beautiful sun deck has a Jacuzzi, barbecue, sun loungers, sun pads and a bar. There’s also a Portuguese bridge and foredeck which have several comfortable seats to relax on. A four-person elevator rounds off the many features on Chasseur. 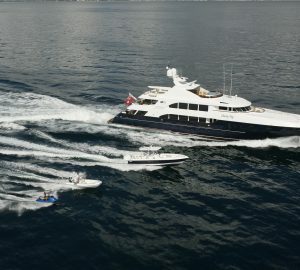 This iconic motor yacht is 49m (161ft) in length and was designed by Christensen Yachts. She made her debut at Fort Lauderdale International Boat Show in 2016 and made quite an impression. 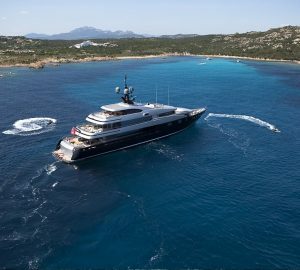 With her glitzy silver hull, beautiful exterior and spectacular interior, Chasseur is an exceptional vessel. The main saloon comprises American walnut, bright, colourful furnishings and splendid artwork. Huge windows allow natural light to enter the airy interior while providing a great connection to the ocean at the same time. There are lots of nautical themes on board Chasseur too. Smooth shells hold pretty flowers on coffee tables while some of the artwork is of sunbathers and things to do with the sea. Santos rosewood cabinets make wonderful accessories with some amazing sculptures standing on them. There’s accommodation for 12 guests in six cabins on board Chasseur. A full beam master suite with daybed and office is also available, what more could you ask for? The spacious VIP cabin has a Hermes Jean-Michel Frank club chair in natural shearling, how about that? All cabins have en suite bathrooms decorated in onyx as well as underfloor heating. The Armani silk-wrapped wall panels are truly out of this world and compliment the walls perfectly. Large woollen rugs and photographs by Acey Harper, a well-known American artist, give the cabins a home-from-home feel. With leather headboards, rosewood beds and large windows, cabins are a most welcome space to relax in after a day in the fresh air. The master suite also has a his and hers bathroom decorated in green vein-cut onyx as well as a separate toilet, bidet rooms including a large steam shower. Accommodation on the lower deck consists of five cabins, all finished off in a style similar to the master cabin. Natural light streams in via the well-placed portholes. Guests can pour themselves cold drinks and other refreshments in the service area which is found amidships. 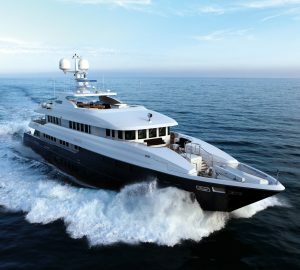 Aft is a single VIP cabin, two twins at the fore and two doubles amidships, each having stunning bathrooms. The VIP cabin also has a woven leather bed and Hermes club chair, luxury indeed! Its en suite is made from Esmerelda green onyx and has a bath tub, separate toilet along with two sinks. As you head outside you’ll notice the large spa pool situated between sun pads on the sun deck. Take in the heady air as you sail along or at anchor, the exotic scenery and beautiful blue waters. Also on this deck amidships is a barbecue and bar where guests can indulge in a tasty meal and drink. There’s a useful awning that offers shade when the weather gets a little too hot. The aft of the sun deck is mainly for storing jet skis and a 40ft Intrepid tender. These can be lowered into the water to make space on deck for a party or other entertainment. Enjoy the water toys such as wake boards, Seabobs, paddle boards, surf boards or kite boards. The tow tender has a 350hp Yamaha engine while the 7.5m LX750 Equator tender has a 220hp Volvo engine and boy do they go! Would you like to see unique marine life, reefs and colourful corals? Just pop on the snorkelling or scuba diving gear to discover mysterious caves, magic dive sites and a completely new world under water. 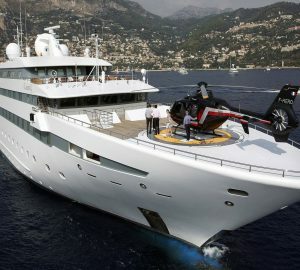 Chasseur also has a helipad on the aft section of the sun deck although this is not available for charter purposes. This extra addition makes this motor yacht stand out from the rest giving guests an idea of how large the exterior deck space really is. Large charter groups of people can be entertained here or a special party celebrated without having to compromise on space. 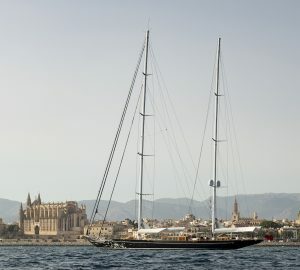 This marvellous vessel also has comprehensive audio-visual systems, satellite TV, iPads, Satcom and Wi-Fi internet access. With no shortage of communication and entertainment facilities, you’re guaranteed a wonderful yacht charter vacation on board Chasseur. Discover new horizons when cruising aboard this yacht to make an exciting, relaxing vacation even more memorable!